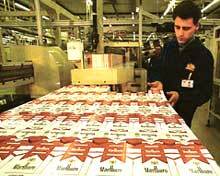 Leading tobacco firm Philip Morris sought to downplay the well-established link between passive smoke and sudden infant death syndrome (sids) by influencing a scientist's research paper, according to researchers at the University of California at San Francisco (ucsf), usa. The ucsf scientists' review of once-secret industry documents has revealed that the firm budgeted us $50,000 to us $100,000 to fund the paper written by British scientists Frank Sullivan and Susan Barlow. The paper appeared in the April 2001 issue of the medical journal Paediatric & Perinatal Epidemiology. The review, published in the March 2005 issue of the journal Pediatrics, traced various drafts of the paper. Some of these included formal comments by Philip Morris executives, made in response to Sullivan's first draft, and handed over to him.